If you have followed my blog for a while, you probably noticed that I am big on including open water in both my landscapes and cityscapes. Actually, the majority of my photos have some kind of water in them: oceans, seas, rivers, lakes, etc. My favorite technique, when shooting water, is to use long exposure photography. When you keep the shutter open for an extended period of time, it creates the unique effect of smooth and silky looking water. My standard approach is to use normal exposure to take bracketed shots of the scene. Afterward, I take a couple of single (non-bracketed) long exposure shots of the same scene in order to achieve this beautiful silky effect in the water. Later, in post processing, I combine the two shots together in Photoshop, using only the area with the water from the long exposure shot and, the rest I keep from standard exposure. This way, I have beautiful smooth and silky looking water with sharp surroundings. 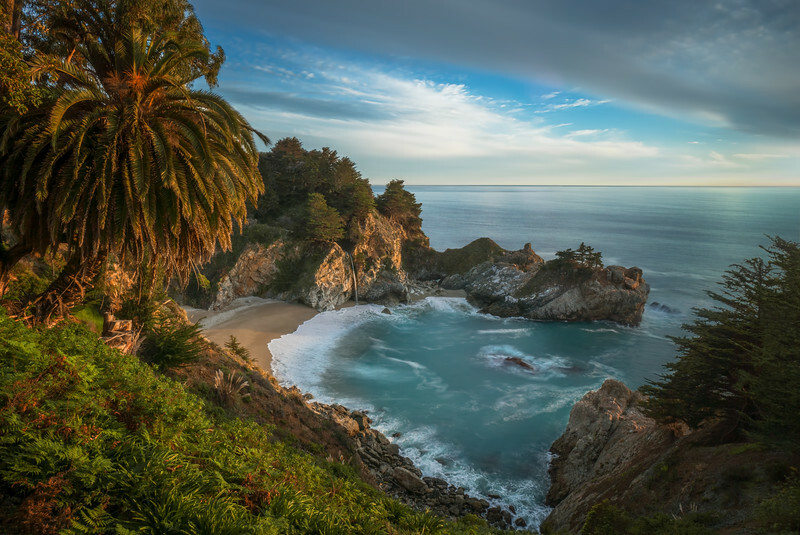 This is the exact approach I used to photograph McWay Falls in Big Sur. The standard exposure shot was perfect to freeze moving objects in the scene (trees, branches) and, the long exposure shot was great for the water and the sky. 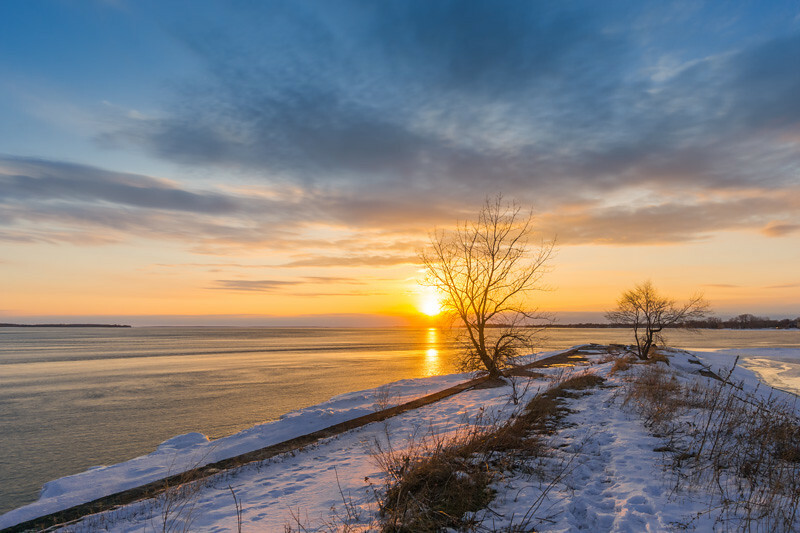 This technique requires a tripod and when you want to slow down the shutter speed in the broad daylight; you also need a Neutral Density Filter. This has always caused problems for me since I often like to go photo hunting in bright light and do not typically carry any extra equipment. Lately, I’ve been experimenting with a new technique where I can achieve the long exposure effect shooting hand-held, without a tripod. The technique is based on blending multiple images in Photoshop using Smart Objects. Below is the photo I took last weekend using this new technique. Please note, no tripod was used. First, I took 3 bracketed shots as I would normally do when shooting for HDR hand-held. I set the camera to Bracketing Mode and took 3 shots with Shutter Speed values at 1/100, 1/200, 1/400 at F8. Then, I switched the camera to Single Shooting Mode and took 10 consecutive shots, pressing shutter 10 times manually, of the scene with the following settings: 1/200 and f8. 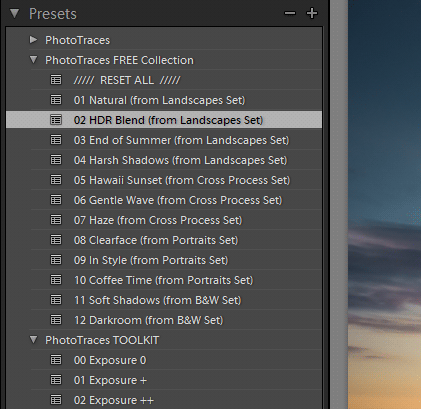 I imported all 13 images into Lightroom. I applied one of my Lightroom presets (HDR Blend from Landscape Collection Vol.1) to all 10 shots, those that I took in single shooting mode. 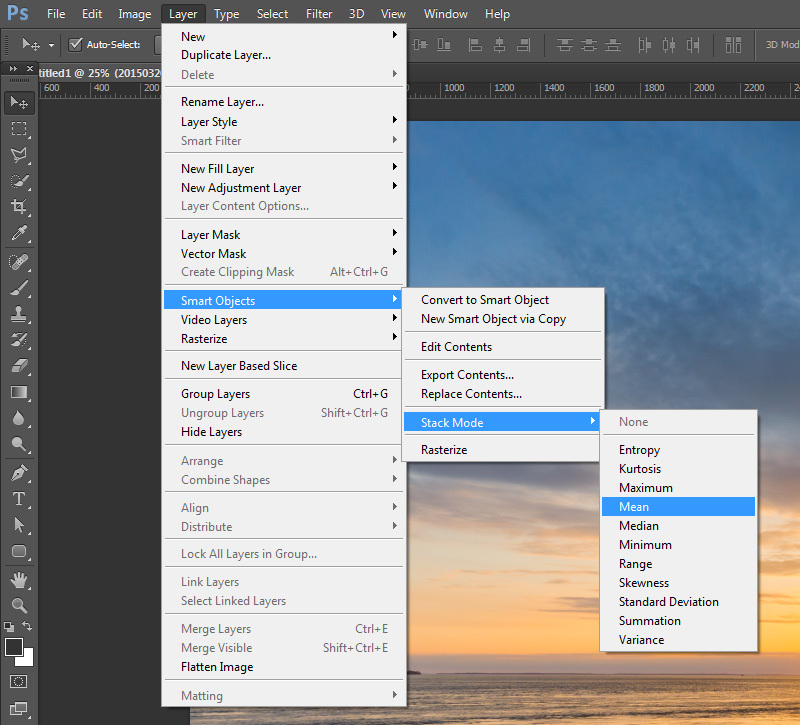 I selected 10 images in Lightroom and used command Edit In > Open As Layers In Photoshop (right/option click). 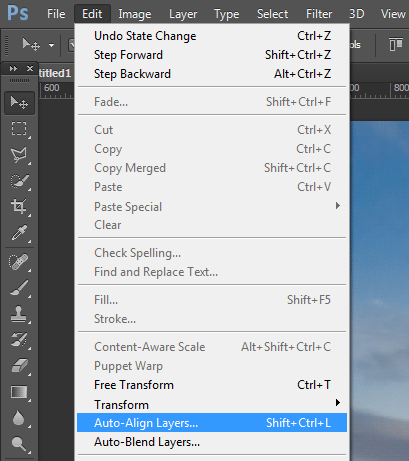 In Photoshop, I selected all 10 layers and auto aligned them using Edit > Auto-Align Layers… with Photojection set to AUTO. 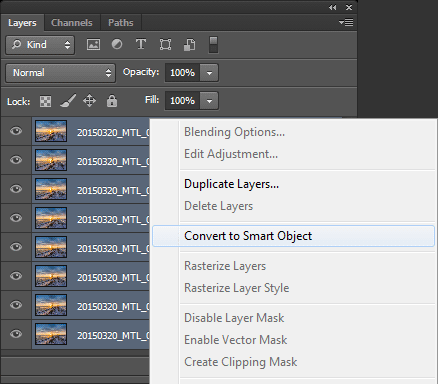 I used the following command to blend the 10 original layers inside of the Smart Object. Layer > Smart Object > Stack Mode > Mean. This resulted in a long exposure effect by moving elements of the scene (water, sky). I went back to Lightroom and analyzed 3 bracketed shots I took with HDR processing in mind. 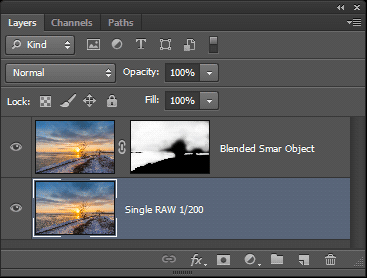 But, after further examination, I realized that I could achieve the desirable HDR effect without HDR processing, using a single RAW file. Once again, I applied the preset HDR Blend to the 1/200 bracket and loaded it to Photoshop as the layer below the previously blended Smart Object. From there, it was standard Photoshop processing. I blended together two layers with the help of transparency masks. I used the area of the water and the sky from the top layer and, the rest of the scene from the bottom layer. I did some cleaning and masking with the Stamp Tool to remove distracting elements. I cropped the image with the Crop Tool to improve the overall composition. Finally, I increased the contrast, boosted the color slightly and applied vignetting. That was it. I managed to achieve the long exposure effect without a tripod or the ND filter, and without sacrificing the quality of the final image. Viktor, that’s a cool technique. Was there any magic to the blending? I always struggle with the selections for the transparency masks. Martin, I agree, sometimes proper masking can be tricky. In this case it was easy. I used soft brush and manually created custom mask. It is always easy to mask/unmask big flat areas. this technique can be very helpful when you have no tripod with you. I use is all the time. Unbelievable! However, I cannot understand how you could keep exactly the same composition when you reset your camera, which should have caused some composition differences among the taken pictures. Great tutorials. Thank you very much. Hi Viktor, great tutorial used it a few times now. Today i have gone to do it again but after converting all layers to smart object i go to step 6 and stack mode is greyed out. Would you know what is wrong? Must have had an update to Photoshop? Reinstalled and we’re back up and running and working correctly. Great. Did you find this technique useful for your photography? Most definitely, used it a few times. Now when I’m going places I’m keeping a look out for any opportunity to apply this technique. Great tip! Wow! 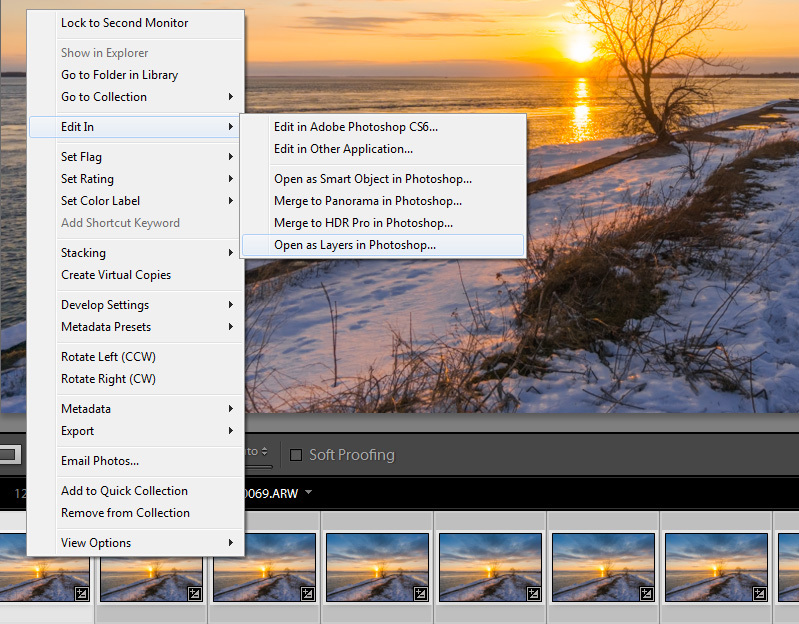 I’d like to see more on what Step 8 entails and the steps you used with the transparency mask.